Situated above the old lime kilns on the quayside in the popular coastal resort of Seahouses. 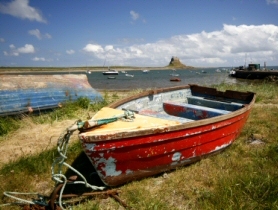 Just off the A1 at Beal which is the gateway to Holy Island. Six is the stunning new rooftop restaurant at BALTIC Centre for Contemporary Art combining breathtaking panoramic views with great food, great service and a great experience. Brought to you by Fresh Element, the style of food is British modern cuisine featuring the very best ingredients simply cooked and served in a relaxed and friendly setting. Traditional countryside inn with freshly home cooked food near to National Trust property Seaton Delaval Hall. From its elevated location in the picturesque village of Newton on the Moor, the Inn enjoys outstanding views of both the Northumbrian Coast and the Cheviot hills. Situated close to the main A1 dual carriageway, some 35 minutes from Newcastle and Berwick. Popular bar foods include locally caught sea produce, freshly made sandwiches, delicious home made soups, and wholesome daytime meals that extend into the evenings. Set on the delightful village green and overlooked by the magnificent Bamburgh Castle.